The Irish Business Against Litter has said that litter blackspots in Dublin and Cork have been improving. A NEW SURVEY has found that certain litter blackspots in Dublin and Cork are not as bad as they used to be. An an overall trend nationally was also seen to be positive, with 75% of areas found to be at least ‘as clean as European norms’. The survey has been carried out by An Taisce on behalf of the Irish Business Against Litter (IBAL) alliance, and has taken a look at 40 towns and cities across Ireland. Where does my town rank? Areas are ranked on a scale relative to the European norms, ranging from ‘littered’, up to ‘cleaner than the European norms’. The area found to be the worst offender was found to be Farranree, an area of Cork city. Despite coming bottom of the list the report describes its improvement from ‘blackspot’ status to ‘littered’ status as “striking”. The bottom five also included Dublin city, Athlone, Dublin north inner city and Portlaoise, all of which were classified as ‘littered’. The least littered town in Ireland was found to be Killarney in Co Kerry, which previously won the Tidy Town award in 2011. The report also took a look at 34 connecting roads and found them to be less littered than last year, although the Monaghan-Cavan road was found to be heavily littered and “created a poor impression”. This report is the first time that no entire towns have been branded blackspots. 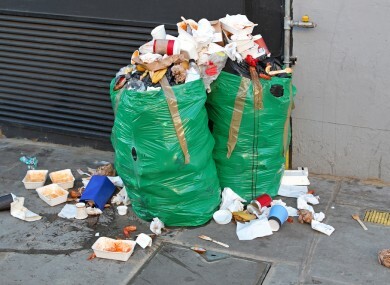 There was disappointment that Grafton Street and O’Connell Street had fallen in classification to ‘moderately littered’. In Dublin, the area around Manor Street, Brunswick Street and Church Street was considered a litter blackspot. The most common forms of litter were found to be sweet papers, cigarette butts, fast food wrappers and chewing gum as the most common forms of litter. The IBAL alliance has been in existence since 1996 and states that its belief is that “economic prosperity… is contingent on a clean, litter-free environment”. Read: Is Dublin City Council doing enough to clean up the city? Email “The most litter-strewn town in Ireland is...”. Feedback on “The most litter-strewn town in Ireland is...”.